In the high stakes testing environment prevalent in today’s American schools, two areas in education that are too frequently overlooked are the psychological and social development of students. To be sure, school districts have provided social workers, psychologists, and teachers trained in educational psychology and child development, but apart from planning developmentally appropriate instruction and handling kids who are in crisis, psychological and social development has often been made an integral part of what students learn about and learn to self manage in school. With instances of school violence and bullying continuing to be a problem, attention to these two areas may be the very thing students need most. Before anyone proposes new laws and new spending on new programs to start a new initiative that addresses these needs, we would all do well to take notice of something that is already in place, already funded (if often under funded) and is more cost effective and just plain more effective than anything the political powers that be could impose. I am referring to music education. Dr. Rubino, senior director of the College Board, said that “it is clear form the research the arts provide the type of emotional, creative and expressive development that students can benefit from throughout their lives.” Politicians, in House Congressional Resolution 355 (EH), wrote that “students who participate in school music programs are less likely to be involved with drugs, gangs, or alcohol and have better attendance in school.” These are all indicators of superior psychological and emotional development, because they suggest healthier ways of coping with psychological and social challenges. Humans were made to be creative, expressive, and enjoyers of beautiful, pleasing, good things; music education provides the context for learning how to create and enjoy the art and artistry of music. Hargreaves & North (1999). (The Functions of music in everyday life: redefining the social in music psychology, Psychology of Music, 27 (1), 71-83) found that music has social functions in everyday life that include self-identity, interpersonal relationships and mood. Self-identity and music are more closely associated where the performer and creator are the same, or at least of the same culture or tradition, and where the things expressed are specific to that culture or tradition. A general love song is much less of a factor in developing self-identity than one that speaks specifically to men or women, or to African Americans or Latinos. Music created within a religious context has strong ties to self-identity, especially when the music encapsulates rites or traditions of worship. Self-identity can also be found in certain musical genres that some relate to more strongly than others. This can be seen in the differences in audiences between hip-hop and jazz music. Our self-identity has a lot to do with the environment and culture we grew up in, and these are frequently evident in the music we create and preserve, less so in music created, or perhaps produced would be a better word, for the mass media which is designed to appeal to many but consequently is truly meaningful to few. Inter-personal relationships are essential to music making in the traditional sense, but less so in more technologically dominant methods of performance and production. When groups of people assemble for the purpose of making music, inter-personal relationships are increased many times over. There is a natural power to bring people together, even strangers, once they are engaged in the act of making music. This is readily apparent at popular music concerts, where crowds of people will sing along, clap along, and dance along to the music as it is performed; people who are total strangers high fiving each other and intuitively sharing the joy of music making. This musical community is all but lost in production studios where collaborating musicians may be hundreds of miles away, and never united until they are heard performing “together” in the finished recording. Because of this, the need for continuing to provide live music experiences to students, both performing and attending concerts, has never been more crucial. Mood is perhaps the most self-evident of the functions. Music is by its very nature expressive, and mood is a natural component of its expressiveness. Research has shown that teens use music to modify their mood regularly. Most of us have experienced being cheered up or pumped up by music we chose to listen to for that purpose. Athletes often use music to motivate them before a competition, and runners frequently listen to music as they go to help them keep a steady cadence at the tempo they have chosen for their run. 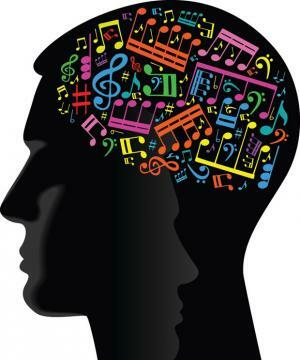 All of this music in peoples lives is helping them develop socially and psychologically, as their self-image and interpersonal skills are advanced through music education.